Open Europe: A new eurozone parliament? This morning, Handelsblatt is reporting that EU Council President Herman Van Rompuy, Commission President José Manuel Barroso, Eurogroup chief Jean-Claude Juncker, and ECB President Mario Draghi's plans to redesign the architecture of the economic and monetary union include the prospect of a new 'eurozone parliament'. Nevertheless, the proposal, if it ever sees the light of day, will be hugely controversial with both euro and non-euro members and would of course require Treaty change. In addition, Van Rompuy and Barroso need reminding that they represent the 27 member EU and not simply the eurozone and that any brief to restructure the eurozone needs to square this with the EU as a whole and the requirements of the single market. Additionally, as we have argued, the UK must ensure that any grand eurozone plans such as these are a quid pro quo for establishing a space in Europe for those countries not intent on joining the single currency, and also for those that may choose to leave. This might then provide a new form of membership that the UK could live with in the long term. What will they call it? House of Cards? Isn't it a bit cruel, showing this picture of four muppets? Four unelected millionares decide to make the "European Project" more "democratic" by constructing a second Legoland parliament (which Europeans will also have to finance). What would George Orwell make of this ? How do they suggest that the Eurozone Parliament would relate to the European Parliament, which itself is powerless window dressing. Macky Dee - People vote - what a ridiculous idea in the EU. Anonymous - Isn't it his idea? Clearly they've (rightly) concluded that with Cameron here as PM they can get away with anything. They think (again rightly) that he's a pushover. as long as we are in the wretched EU it will be one stitch-up (usually in the small print) after another agreed in the small hours. - Bugsy - The EU parliament used to be as "powerless window dressing. " - but no more. It flexes its muscles all the time to some effect now. Have these guys ever made a law or a treaty? Put in the maximum number of controversial topics; arrange it in the most complicated and timeconsuming way and think it can be done by the end of this year. The photo's with an article always give a good indication how the medium thinks about the persons involved. 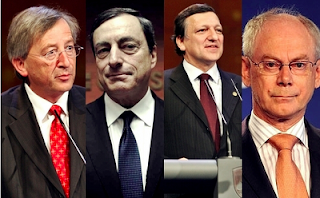 Draghi: a nice whitish, with a touch of green and grey, zombie-look. Barosso: as the ideal stand-in for the main character in the new Dracula movie. Rompy; as the personification of Humpty Dumpty, but there are probably not more flatering pictures of him. As long as he donot starts reading his haiku everything is ok with me. Always pleased that there are actually people around that are less photogenic than myself. Juncker: as a bit p.....,eh sorry just having had a tasting of the local wine (export promotion without a doubt, you have to do all sort of things to get reelected eh serve your country), also nothing unusual. "Nevertheless, the proposal, if it ever sees the light of day, will be hugely controversial with both euro and non-euro members and would of course require Treaty change." I'm not so sure that it would require any further change to the EU treaties. Firstly there is the EU treaty change agreed by EU leaders on March 25th 2011, which is presently being approved by a Bill going through the Commons prior to UK ratification. "The Member States whose currency is the euro may establish a stability mechanism to be activated if indispensable to safeguard the stability of the euro area as a whole ..."
and while so far that has generally been taken to mean just that the eurozone states may set up the ESM it's already been suggested that it should be extended to a "bankruptcy mechanism", so why not take another leap of the imagination and suggest that really the ESM needs to be given more democratic legitimacy, and the eurozone states have been given the legal right to arrange that? Secondly there are the EU treaty provisions on "enhanced co-operation". Monetary policy for the eurozone states is an exclusive competence of the EU and there is no residual scope for enhanced co-operation, but "internal market" and "economic, social and territorial cohesion" are shared competences and the eurozone states could say that they needed to enhance their co-operation in those areas by having a parliament. As I understand - correct me if I'm wrong - the Council decision on whether to authorise that enhanced co-operation would be taken by qualified majority vote, only a proposal for enhanced co-operation on foreign and security policy requiring unanimous approval on the Council. That would give them access to the EU's institutions and facilities; they would have to "comply with the Treaties and Union law" in whatever they did, but of course that would be the treaties as amended by the de jure treaty change agreed on March 25th 2011, as well as the de facto, and therefore illegal, purported change to the jurisdiction of the ECJ that Cameron allowed to be made through the "fiscal pact", and in any case their compliance or non-compliance would ultimately be judged by the federalist lawyers on the ECJ. Thirdly that experience on the "fiscal pact" shows that Cameron will allow Merkel to walk all over him, as Christina Speight has pointed out, and indeed as the previous failure to condemn the illegal eurozone bailouts also showed, so he would do nothing about it even if there were very strong, apparently incontrovertible, legal objections to what the eurozone states led by Germany wanted to do. So if Merkel wanted the standing orders of the EU Parliament changed so that for some sessions it sat as a eurozone parliament, in the same building using all the facilities at the expense of the EU as a whole, with just the MEPs from the eurozone states plus maybe some seconded national parliamentarians, then by one devious route or another she could probably get what she wanted without any need to change the EU treaties. "Additionally, as we have argued, the UK must ensure that any grand eurozone plans such as these are a quid pro quo for establishing a space in Europe for those countries not intent on joining the single currency, and also for those that may choose to leave." Apart from the UK and Denmark, the only EU member states which have treaty opt-outs from ever having to join the euro, all of the present EU member states not yet in the euro are legally required to be intent on joining it, and any country which wants to join the EU must agree that it will also become intent on joining it, and no country may ever leave it by choice or otherwise. As Cameron threw away the opportunity to get those obligations and restrictions removed as part of a quid pro quo for going along with the radical EU treaty change agreed on March 25th 2011, there are still only two countries which could ever need that space in Europe and there can never be more than those two, and most Danish politicians would very much prefer it if Denmark was not in that category with the UK but instead was in the euro. The UK, by virtue of opting out of the euro, has lost whatever leverage it had upon the euro members.